A Follow Up from Terri P! Hey there everyone! I was having so much fun telling you about the races and everything else over here in Prague, that I almost forgot about all the fun we had at dinner tonight. Now we told you we&apos;d fill you in on what to do, where to stay and where to eat while we were here...well, this is where to eat!!!!! I am no food critic but I must convey my wonderful feelings about our dinner tonight at Gratia or at least I think that is the name. I forgot the card on the table but I am sure Christine and Kevin will mention it too. It was awesome like better Italian than I had in Italy three years ago. The owner is Italian and his wife his Czech. 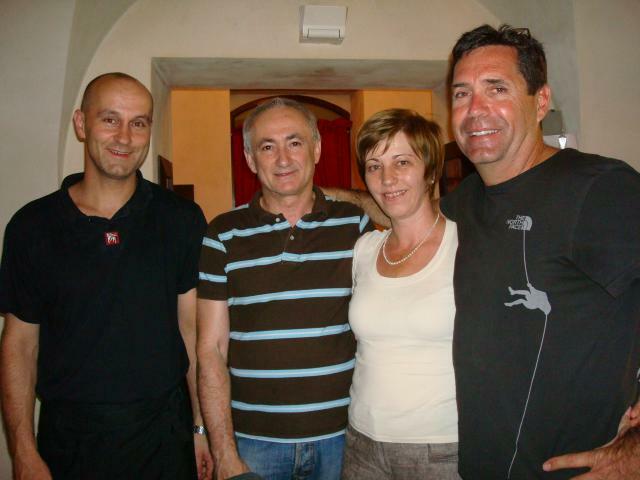 See the picture with the waiter, owner, owner and Kevin. No one was in the restaurant so we will a little worried but it was 9:30 at night. Little late to be eating but a long day at the race course. We had the restaurant to ourselves. I ordered the spinach ravioli and it was the best that I ever had. So yummy. I could have had three more squares of pasta for sure. So of course, I had to eat dessert. He said tiramisu was the best. I didn’t really want it nor do I particularly like it but had to have it as it was recommended. So glad I did. It was awesome. Never had any better. Really delicious. I usually don’t want to eat at the same place on vacation like I don’t watch reruns – been there, done that – but tonight, I will appeal to the group to see this restaurant again. They have this wine cellar area in the bottom of the restaurant with additional seating. I sent pics so you can see...they will probably be up on the facebook page (www.facebook.com/visittampabay). It is such a cool place and it is tucked away where I don’t think people can find it. We have made it our mission to put it on foodie websites. Never been on a foodie website but I will now. It was such a long day at the race course with opening ceremonies, buying tents, blah blah so going to a nice, inexpensive, awesome dinner was a perfect way to end the day. Oh, and one more thought...The Iranian team is here competing. The women have their heads covered but they are in racing attire. My first thought other than how nice they are…. Very attractive. We decided they were some of the most beautiful women and men here. This is why sports are so important...you get the chance meet people on a different level. Good night everyone...more to come tomorrow. Go Tampa Bay!